Oceanfront homes could be demolished along California's coastline under a groundbreaking proposal to preserve the state's made-for-movies beaches before they're destroyed by rising seawater. E&E News examines how climate change will permanently alter the state's iconic sights. Click here to view the series. A draft version of the guidance includes sections on "managed retreat," the government process of buying threatened homes and relocating them or tearing them down. The commission's objective is to preserve the state's idyllic beaches for the public. Removing homes can free the coastline to move farther inland, preserving beaches' sandy characteristics. The other option is "holding the line" and "protecting shorelines with armoring," says the draft guidance, which argues against relying on sea walls for fear that they would make sandy beaches disappear under rising ocean water. Instead, it says threatened properties should be removed, modified or relocated. In the eyes of the commission, the rising ocean inevitably will wipe out many homes. The commission oversees development along the state's 1,100 miles of iconic coastline. It has oversight over municipalities as they write land-use rules. Local officials in theory can reject the agency's guidance when drafting adaptation plans for sea-level rise. But the commission has leverage. It can in some cases control permitting related to coastal construction of homes, residential redevelopment and the building of sea walls. The commission has a sprawling mandate: It's there to protect the state's beaches for the public. That mission is getting harder. A report last year from the U.S. Geological Survey projected that sea-level rise could drown as much as two-thirds of state beaches by 2100 (Climatewire, July 12, 2017). Retreat raises thorny legal and economic issues. If homeowners are unwilling to sell, cities would need to use eminent domain to take private property for the public good. That promises to trigger court battles. Cities would also need to find the money to pay for high-priced oceanfront homes — only to raze them. The proposal has triggered a flood of objections. Some cities have opposed retreat in their adaptation plans, or promised residents they will. Beach homeowners have packed local council and community meetings, demanding help from elected officials. Some residents are reaching out to state lawmakers. The pushback pressured the commission to delay hearings on the guidance until next year. The agency plans to talk with cities in a bid to cool heated interactions, commission Executive Director Jack Ainsworth said at the agency's October meeting. "There is a lot of fear and uncertainty associated with these planning efforts throughout the state," Ainsworth said at the meeting. "There's fear about the loss of property values. We've got loss of a tax base, anxiety about managed retreat and what it means, concerns about taking of private property. These have become a loud and building message in the discussion surrounding our guidance." Some cities are refusing to change their policies to address sea-level rise. Others want to use sea walls and armoring "to the exclusion of all other adaptation strategies," Ainsworth said, adding that local governments must respond to this "slow-moving disaster." California appears to be the first state in the country to be considering retreat so broadly. "It's unusual have an agency that looks at the coast and says, 'Let's take a look at all of these pieces together,'" said A.R. Siders, an environmental fellow at Harvard University. Other states are applying adaptation policies in a more piecemeal way, Siders said. New Jersey has a "Blue Acres" program to buy out flood-prone homes. Houston purchased about 3,000 houses located in the floodplain. The Federal Emergency Management Agency has purchased about 40,000 homes, since the 1990s, that have been repeatedly inundated. In California, retreat is already happening as cliffs collapse. "When you have higher, bigger storms and sea level is rising, then you assume there's going to be more erosion at the bottom of the cliffs," said Adam Young, a project scientist at the Scripps Institution of Oceanography at the University of California, San Diego. In Sonoma, near San Francisco, chunks of oceanfront cliffs have fallen away, putting numerous homes at risk. Eleven have been torn down or have collapsed into the sea. Two homes are still standing but are deemed unsafe for occupancy. The California Department of Transportation (Caltrans) plans to move a section of nearby Highway 1 inland. In San Luis Obispo, located north of Santa Barbara, Caltrans shifted 3 miles of Highway 1 to the east. The agency condemned and purchased homes using eminent domain. 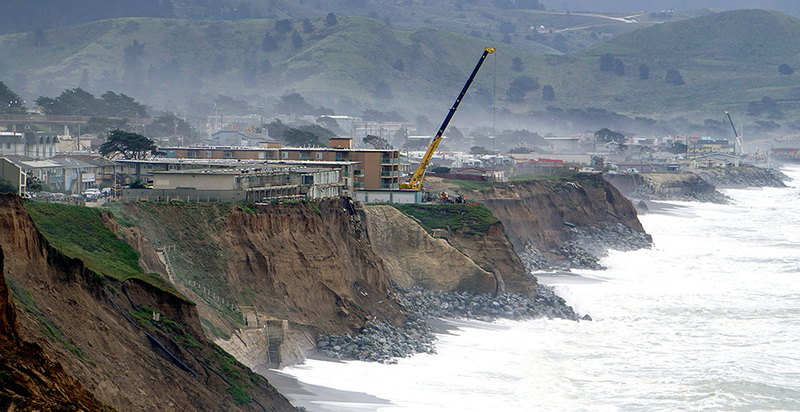 Seaside cliffs have crumbled in Pacifica, south of San Francisco. That forced the demolition of three apartment buildings and three homes. City officials say El Niño storms contributed to that cliff erosion. Pacifica now is using eminent domain to buy land where two of the apartments were located. It wants to create a buffer to prevent future cliff collapses because a sewer line is located beneath the street. Madeline Cavalieri, statewide planning manager for the California Coastal Commission, called events in Pacifica "unmanaged retreat." That's going to happen more without advance planning, she said. Hearings on a revised version of the commission's guidance could be held in late winter 2019, Ainsworth said. To get public support for its guidance, the commission is considering a public education campaign, Ainsworth said, on "how sea-level rise affects us all." Other areas of the country have avoided the term "retreat" because it's so inflammatory, said Siders of Harvard. "It's just a very emotional term," she said. "People don't like the word 'retreat' because it sounds like we're losing, which is sort of nonsensical when it's you versus the ocean. You're not going to win that fight." The commission guidance suggests when and how to implement managed retreat. Cities should set triggers for retreat, it says, such as a minimum beach width for "optimum public recreational access." Local governments can pursue sand replenishment where possible, it says. Cities in San Diego's North County hope to participate in a federally sponsored plan for 50 years of beach sand replacement. But once those aren't feasible, it argues, cities must consider retreat. The guidance could be far-reaching. All new development and major redevelopment in a city's designated zone would need to enroll in a managed retreat program, the guidance says. Permits for that development, it says, "shall be conditioned to require its modification or removal when necessary to maintain the minimum beach width." On top of that, the commission argues that a home's deed should disclose that the property could be removed or modified if the beach shrinks to a certain width. That would "notify all new owners of this condition," the guidance says. The guidance suggests that cities should seek funding to buy homes. One option it offers is acquiring beach homes and then renting them out until they're damaged. All the retreat ideas right now are "conceptual," said Cavalieri, of the commission. Retreat isn't mentioned in the 1976 California Coastal Act, the law that gives the commission its authority, said Arie Spangler, an attorney with the Coastal Rights Coalition, a homeowners group. It's "really just an underground regulation that they're trying to push through," she said. If the commission wants managed retreat, it should get authority from the California Legislature, she said. Moreover, the California Constitution grants residents rights that include "protecting property," Spangler said. Assemblymember Mark Stone (D), a former California Coastal Commission member, said the Legislature isn't likely to pass statewide adaptation policy anytime soon, based on what he's seen. Last year, it rejected his bill on rules for sea walls. Asked what could prompt action, Stone said, "I don't know, short of catastrophes." The commission contends that its authority comes through the California Coastal Act, passed by the Legislature. That law mandates beach access. The agency's leverage over cities comes as they write adaptation blueprints. Those go into local planning rulebooks that the commission certifies or rejects. If a city lacks a certified "Local Coastal Program," or LCP, the commission exerts greater control over permits in the coastal areas. The commission guidance is advisory, not a regulation. But that's not its real-world effect, said Larry Salzman, an attorney with the Pacific Legal Foundation (PLF), which has represented homeowners challenging Coastal Commission decisions. "This guidance is essentially putting cities on notice as to what the commission wants to see and will likely impose on them as a condition of certifying" LCPs, Salzman said. "While it's couched in terms of draft guidance, it's a declaration of 'Fall into line with what the commission wants, or you're not going to get local control over your permitting decisions.'" The commission already limits sea walls in some areas, in general restricting those to homes that existed before the Coastal Act took effect in 1977. Developers that build new homes must waive the right to future sea walls. If a home is remodeled to more than 50 percent of its size, homeowners also can be forced to forfeit their right to shoreline armoring. From September 2010 through this April, the commission issued 160 permits for residential construction on oceanfront property. Of those, 139 surrendered the right to future shoreline protection, according to a lawsuit from PLF and the Coastal Rights Coalition. California cities are weighing whether to include retreat as they write sea-level-rise adaptation plans. It might be an option, but not in the near term, said Serge Dedina, mayor of Imperial Beach, the southwesternmost city in the continental United States. "We have to look at all the tools we have to start addressing sea-level rise," Dedina said, adding that there are "over 40 different tools that we can use before we get there." Other communities are rejecting retreat entirely. Del Mar, a town of 4,200 people, said retreat isn't feasible due to "economic, environmental, engineering, social, political, and legal constraints and uncertainties." The city can't afford to buy homes, it said. Del Mar's median home price is $2.6 million. Beachfront property sells for a lot more. The city council in October passed an ordinance promising to fight any Coastal Commission effort to impose retreat (Climatewire, Oct. 17). That came even though a sea-level-rise study Del Mar commissioned found that the dry sands could disappear in winter by 2030 and vanish completely by 2050. The city counts on tourism dollars from 3 million annual visitors. Del Mar plans to deal with rising waters by replenishing sand on the beach, building a berm near a river, and other options, said Terry Gaasterland, chairman of Del Mar's Sea Level Rise Stakeholder Technical Advisory Committee. "We protect. We don't retreat," he said.